Secure. Compliant. Built for Top Performance. Parsec Data’s Cloud Solutions are reliable, scalable and architected for both high-availability (HA) and standard availability based on your business’ needs and budget. Our top-tier cloud infrastructure is backed by up to a 100% Service Level Agreement (SLA). Our blend of top internet carriers and network connectivity to numerous other data centers or your brick and mortar allow for nationwide and international highly-available, low-latency, high-throughput data transfer. Parsec’s Cloud Computing solutions, all built upon industry-leading VMware technologies, enable our customers to take advantage of our hosted Private, Public, and Hybrid Cloud Solutions without having to fully migrate off their existing infrastructure. Unlike legacy Colocation and Hosting providers, we’ve built our VMware-based solutions from the ground up in the Cloud so you can take immediate advantage of the agility and efficiency of the Cloud, while still leveraging your existing infrastructure investments. These solutions offer you the opportunity to get out of the data center and infrastructure ownership business, and consume these products as a service. Your business can instantly realize the benefits of switching from capital expense to operational expense while having an unlimited growth path. This will allow you to concentrate on growing your business. 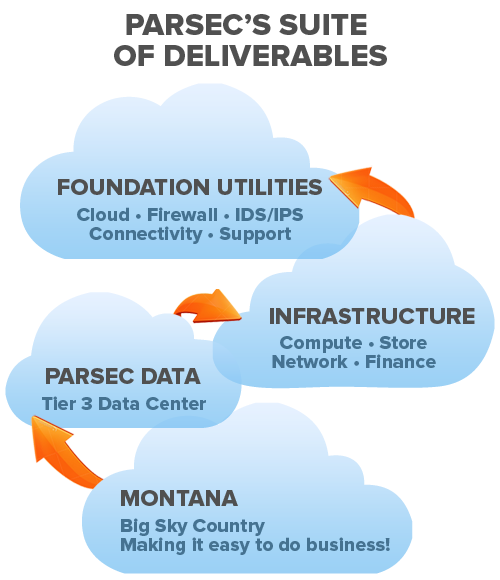 Parsec Data’s Private Cloud provides your servers and storage devices are private, dedicated assets housed in the Parsec’s Montana-based, safe, secure data center. Everything is accessible and managed via a network connection. Parsec’s cloud management portals allow on-demand access to your resource pools, enabling IT professionals to partition each dedicated resource into virtual machines with variable amounts of each resource assigned to each. Parsec’s Private Cloud is an ideal way to take advantage of the value Cloud offers while maintaining the security of dedicated resources and network access. Parsec can also offer businesses a Public Cloud. Public Clouds, as opposed to private clouds, reside in a multi-tentant environment. Two companies with two separate virtual machines will live on the same server and draw elastic compute and storage resources from the overall public pool. Public Cloud is ideal for developers looking to quickly spin-up some compute resources or for businesses to stand up a public website. Hybrid Cloud environments can be achieved with Parsec’s Public and Private Cloud solutions. Your existing on-premise infrastructure can be linked to dedicated private cloud resources and public cloud resources. By definition, Hybrid Cloud is defined as “two or more clouds (private, community or public) that remain unique entities but are bound together, offering the benefits of multiple deployment models.” Hybrid cloud services have been identified as the ideal bridge for companies looking to go Cloud with some applications, but not others.